Try printing on metal for a stylish and modern alternative to the traditional framed photo. Perfect for your home or as a gift, personalized aluminium prints bring your photos to life through vibrant, high definition colours. It's available in 7 sizes, landscape or portrait so there's aluminium prints for everyone. 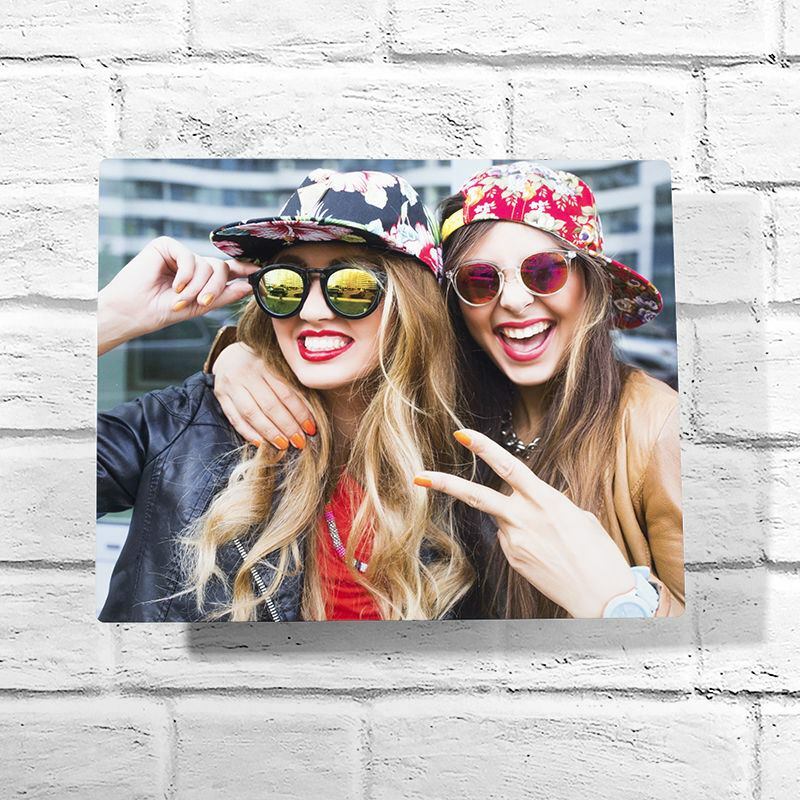 A lovely addition to any home, aluminium photo prints have a glossy finish, are UV and scratch resistant and are available in 4 different sizes. The small, medium and large aluminium prints are rectangular and the extra large is square. At 0.08" the aluminium is thick and sturdy to give your print a longer life, and the rounded corners have a 0.16" radius. Very nicely done. Super quick delivery. Love it! This frame added a nice touch to my pictures. Printing on metal ensures your photos really pop and stand out in any sized room. Made from 0.08" of robust aluminium and a UV and scratch resistant finish, this is the ideal way to preserve a cherished memory. The high definition colors are fade-resistant and because the ink is chemically bonded to the metal, these aluminium art prints are designed to last. To ensure your metal prints have the longest life possible and for colors to remain fresh and bright, we advise to not place it in direct sunlight for long periods of time. Mounting is easy - there's no assembly required and all you need is a screw and wall plug in order to safely hang your aluminium prints. The fact it sits away from the wall by 0.86" - it has a 'floating' effect and also prevents any friction between the metal photo prints and your wall. In terms of cleaning, a quick wipe to remove any dust is all that's needed. We source, print and ship everything here at Bags of Love, so you know your personalized aluminium prints have been made by passionate experts who really care. What Will My Photos Printed On Metal Actually Look Like? The look and feel of the aluminium prints when you finally have it in front of you says more than words ever could. Whether you've opted for small, medium or large, these metal photo prints will look right at home on any wall that's in need of a makeover. We can print a single photo that means a lot to you, a photo collage if you really can't choose or even an original piece of work that you want to display proudly for loved ones to admire. Also, because they are 'shadow mounted', your aluminium prints look like they're floating - the perfect conversation starter! Whatever aluminium art prints you choose, it will make a great addition to your home or as a thoughtful gift for family and friends. Like many of our products, we offer a quantity discount, so put a smile on your family and friends faces and buy more than 1 to receive a discount today. High-definition prints, on metal, who'd have thought? Made from 0.08" of robust aluminium and a UV and scratch resistant finish, this is the ideal way to preserve a cherished memory. The high definition colors are fade-resistant and because the ink is chemically bonded to the metal, these aluminium art prints are designed to last. To ensure your metal prints have the longest life possible and for colors to remain fresh and bright, we advise to not place it in direct sunlight for long periods of time. Because three of the sizes available have a 3:2 ratio, our aluminium prints have a very 'arty' feel, meaning illustrations and graphic design pieces work just as well as a normal photo. Feel inspired by a cute drawing you've seen online? Found a funny quote that really resonates with you? Have them printed onto metal to ensure it's everlasting. If you have a variety of photos but can't decide which ones should make the cut, we'd suggest going for a photo collage. These collages are also great for celebrating your child's or grandchild's 18th or 21st birthday, reminding them (or embarrassing them) with pictures from the past. For a more sentimental purchase, give your husband or wife their favorite photo of your family all together.